Ana Marie Cox hosts Crooked Media’s With Friends Like These, a podcast about what divides us and what doesn’t, and writes SYFY Wire’s Space the Nation column. Her writing has appeared in The Washington Post, The New Republic, The Guardian, Esquire, GQ and lots of other places. She was MTV News’ senior political correspondent in 2016, and from 2015 to 2017, she conducted The New York Times Magazine’s “Talk” interviews. In 2004 she founded Wonkette, prompting a whole bunch of media establishment types to describe her as “foul-mouthed.” She’s also the author of “Dog Days,” a novel (Christopher Buckley called it “smart, smutty and very well-written”!). Follow Ana on Twitter and on Instagram! Ana is put to the test in an extra-challenging Cat Quiz: You Know A Lot About American Politics, But Do You Know A Lot About American Politics… With Cats? [Cat Quiz Spoiler] Here’s the Angie Craig ad from Question 3. [Cat Quiz Spoiler] You absolutely must watch this C-SPAN report on Socks Clinton’s Inaugural gala at the Ritz-Carlton. A political debate that won’t upset anyone: Would a cat make a good president? Plus! Some economical ideas for reforming the CIA. Ana’s dog, Exley, is named for Fred Exley, author of “A Fan’s Notes.” Here’s a thoughtful appreciation by Ivy Pochoda at The Rumpus. Ana explains how Luke and Leia have supported her and her husband’s sobriety, and why cats are ideal 12-step sponsors. We were going to joke around some more, but instead we talked about our brains and how they malfunction, and how our cats help us get through (and over and around) that! I really appreciate Ana’s honesty, and hope you do too. 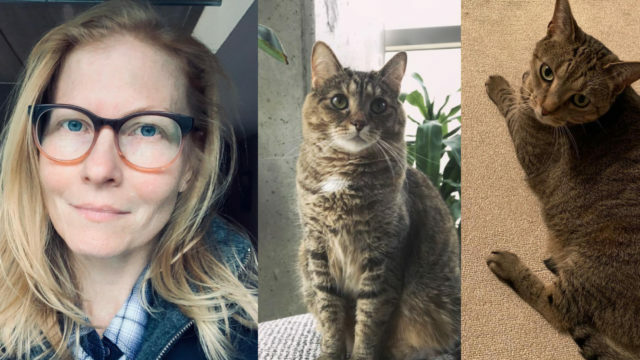 Also please remember: If you or someone you know is struggling, cats are great, but the folks at the National Suicide Prevention Lifeline are professionals who can help.